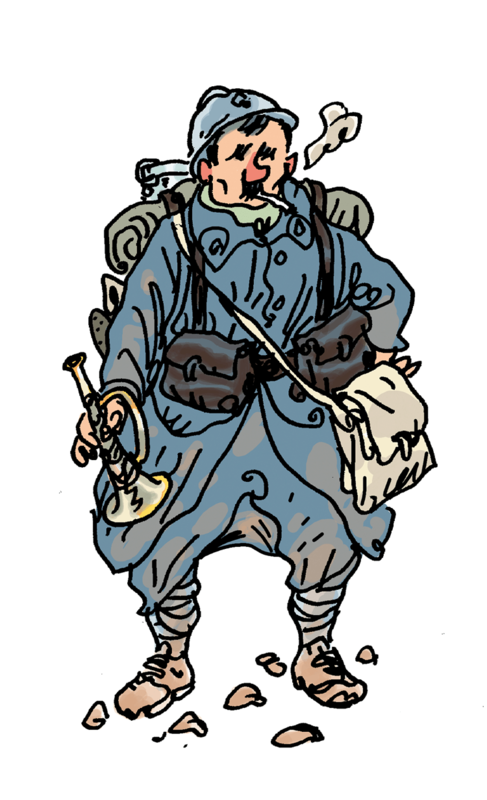 You are a band of young soldiers trying to survive World War One. Will you live to see the end of the war and the peace established, or will you succumb to the cold, the rot and the poor morale in the muddy trenches. 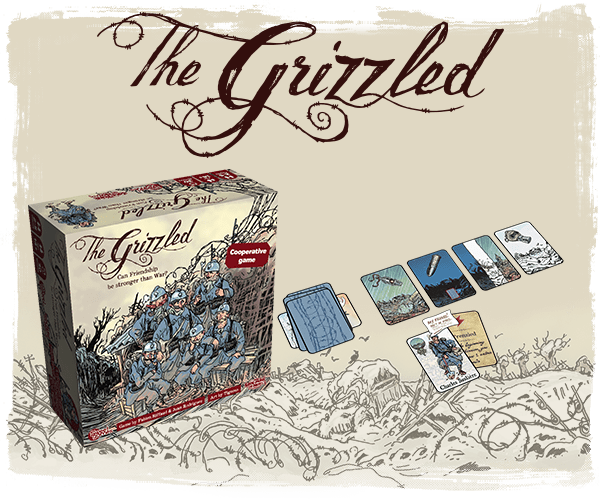 The Grizzled makes you think hard about your choices and – as in any good coop game – fail a lot. What is The Grizzled like? In The Grizzled you cooperatively try to survive the war. You win the game if you live to see the peace being signed. This happens if play all the cards in a draw deck called the trials pile. This isn’t an easy task, and your groups morale is constantly challenged, symbolised in the game by a different deck, the morale pile. If you get through all the cards in the morale pile, you loose. You will get rid of cards from the trials pile by going on missions. Before each mission, a player choose how many cards they deem safe for everyone to pick up from the trials pile. You beat missions by playing cards from your hand in turn to a common area (in most cases) until everyone have passed. These cards have various symbols on them representing threats to your worn group of soldiers. You want to get rid of as many cards as possible from your hand. However if three of the same types of threats are played in the same mission, the mission is lost and all the threats the soldiers survived, are in vain as the cards the players have played on this mission are shuffled back into the trials pile. Instead of playing a card, a player may choose to pass by withdraw from the mission. If all players withdraw from a mission before three of the same threats are played, the mission is a success. After each mission, no matter the outcome, you tally the amount of cards players still have in their hands and take this number of cards from the morale pile and shuffle them in to the trials pile. The real meat of the game however comes from an ingenious mechanic. When players withdraw from a mission they play a support token. This token points to a player either to the right or to the left (or two steps to the right/left). The other players will rarely know what tokens you have available and is always played in secret. After a mission you look at the support tokens and pass them to the players they point to. The player with the most tokens gets support. This player may then discard two hard knock cards. Hard knocks are a different kind of cards that are played in front of the players instead of in the common area. They have devastating effects and a big part of the game is to manage these so that no player gets to many of them. It is really hard to keep track of what support tokens each player has and a player may run out if you are not careful. So you have to balance when to give a player with few support tokens the support vote and when to give it to someone with a lot of hard knock cards in front of you. And the players can’t discuss who they will support. This makes the game very tense. You feel like every single move is of great importance. In The Grizzled, no decisions should be taken lightly. To win you have to think hard and have a bit of luck. As players are not allowed to discuss who they support or what cards they have on their hand there is no “alpha gamer” problem, where one player tells everyone what to do – a problem many other cooperative games have. I like this game, but the intensity and the feeling of weight of the decisions means that I would only want to play once every once in a while and not many times in a row, even though the playing time allows for it. I have won only once in the game out of more than ten games so it is difficult. I do feel like the player number plays some part in how difficult the game is, and that the game plays best with four or five players. I enjoyed it a lot and it almost feels like an auteur game. Although auteur is not really a term I have heard used about board games before, I think this is getting close. Is this game fun? Well you will rarely be laughing out loud. But you will be having an experience like no other game I have tried. This is really something special, but I am sure it is not a game for everyone either. Not everyone will like loosing a lot and the game can seem quite unforgiving. I found the game very entertaining if not downright fun. Despite this being a card game and somewhat abstracted, I think the theme really comes through. You feel the weight of your decisions and that your decisions matter for everyone. It is tense and original. I love the art in this game. It is done by the incredible (and sadly recently killed in the Charlie Hebdo terrorist attack) artist Tignous. He has done a style that is cartoony but in a rough style that fits the era and the theme of the game. This is a card game and the components are cards so not a lot of room to shine there. BUT the publisher chose to make the most out of every single piece in the game. From the box to the first player marker. The box is beautifully illustrated on the inside and is of great quality. The rules are sufficient but a little hard to wrap your head around the first time you read them and that is what drags this rating down a bit. This is an easy game to play and teach from a rules perspective. The difficulty lies in the decisions not in the rules. Jacob is a 30-something regular family guy. Having played some sort of tabletop gaming (Warhammer Fantasy, MtG, and many other games) most of his life, he now mostly play board games. 7 Wonders: Duel Andy Steiger Antoine Bauza Blue Orange Games Bruno Cathala Bruno Faidutti Christian Fiore Czech Games Edition Daily Magic Games Days of Wonder Essen Essen SPIEL Fantasy Flight Games Five Tribes Floodgate Games IELLO Ignacy Trzewiczek Imperial Settlers Jacqui Davis Klemens Franz Kosmos Level 99 games Mac Gerdts Mariano Iannelli Matagot Ostia Spiele Phil Walker-Harding Portal Games R&D Games Raiders of the North Sea Renegade Game Studios SPIEL Stefan Risthaus Stonemaier Games Stronghold Games Sushi Go! Targi Tasty Minstrel Games The Networks UK Games Expo Valeria: Card Kingdoms Vincent Dutrait Vlaada Chvátil Vladimír Suchý What's Your Game?